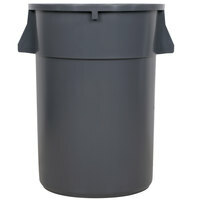 Make your waste collection more efficient with this Rubbermaid FG264360GRAY BRUTE 44 gallon gray trash can. 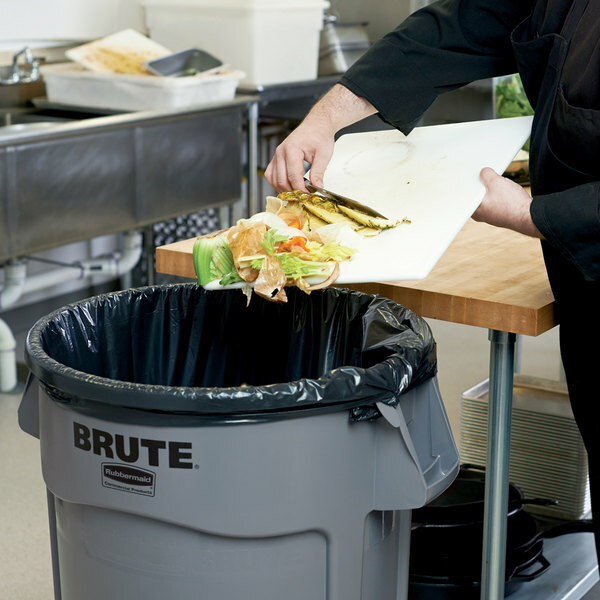 Whether you own a high end restaurant, hospitality service, retail establishment, or healthcare facility, efficient waste collection is crucial for day-in, day-out operation. 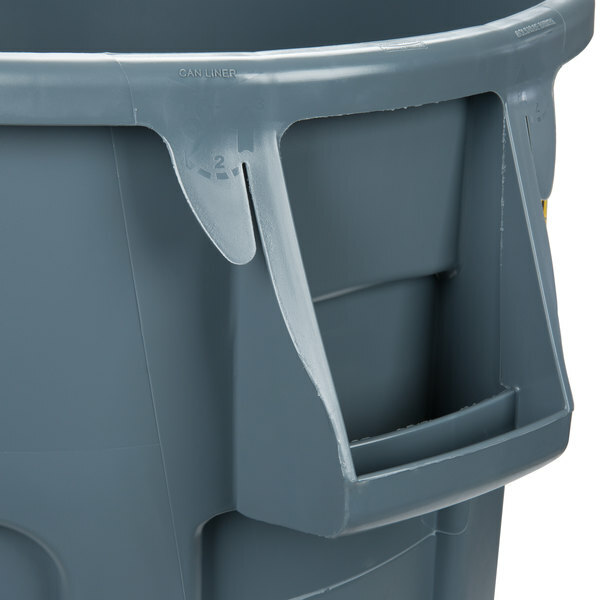 This heavy-duty, durable gray trash container features an all plastic, professional-grade construction that resists dents and does not fade, warp, or crack with continuous use. With a 44 gallon capacity, this container is food safe for use in both storage or food prep applications. "These trash containers are well made and durable. We put them through quite a workout in our restaurant and use them everywhere. A good value." 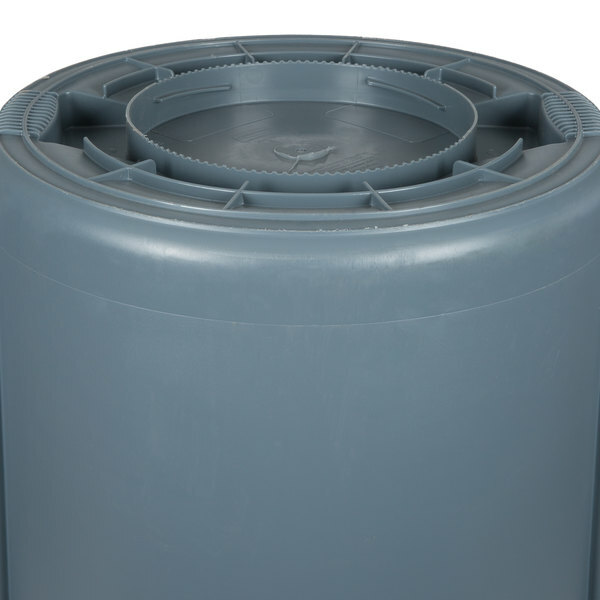 Featuring four integrated venting channels, this design allows air flow around and below the bag, reducing the required force of trash bag removal. 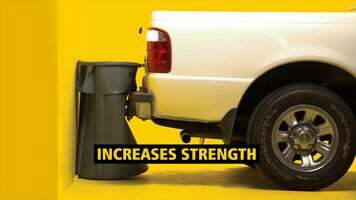 In comparison to traditional containers, this force is reduced by 50%, making it less strenuous for your staff. Two built-in ProTouch handles provide comfortable, non-slip lifting and anti-jam nesting. Four can liner cinches securely clasp onto the bag ensuring it remains stationary and eliminates the need for typing a knot. The bottom's molded base grips are deeply ribbed for optimal control during emptying. 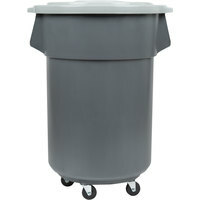 What size kegs will fit in this trash can? We recommend measuring the diameter and height of your keg and comparing those measurements to those of your trash can. Keep in mind the closer the dimensions of the keg are to those of your trash can, the less room you will have for ice. 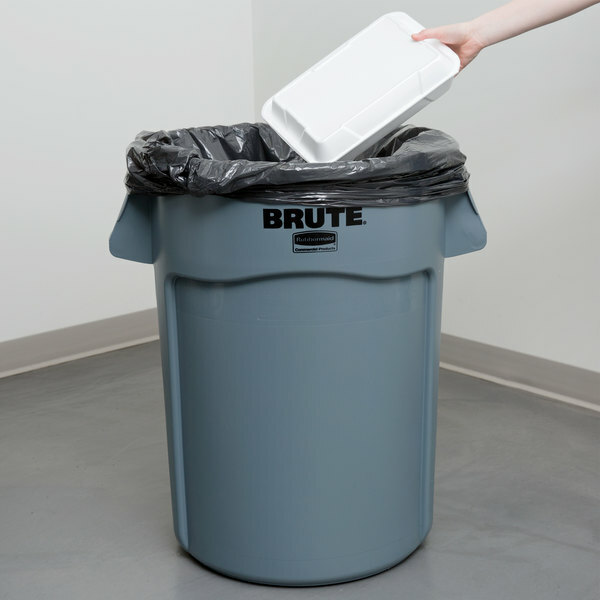 Learn why Rubbermaid Brute trash containers are sure to provide you with the heavy duty waste receptacle you need for any industrial application! Rubbermaid Commercial Products has enhanced their Brute containers for better airflow and overall productivity. Check out this brief video to learn more! 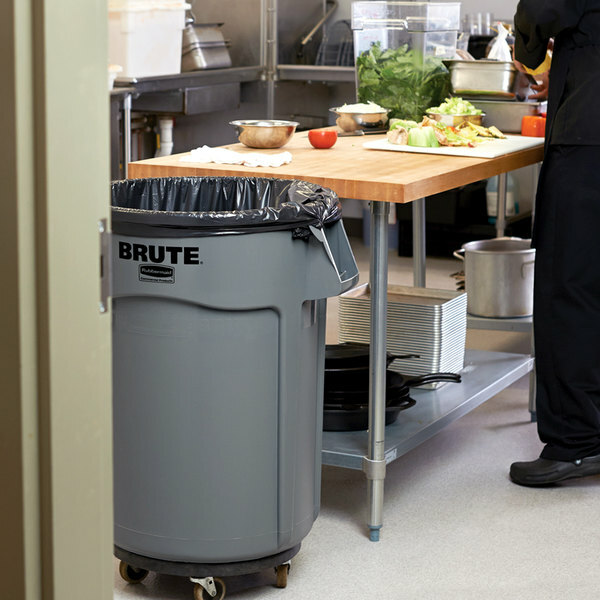 Designed with unique venting channels that make it 50% easier to change trash liners than standard trash cans, Rubbermaid's improved line of Brute containers will help you increase efficiency in any establishment. Wanna add some muscle to your jobs? 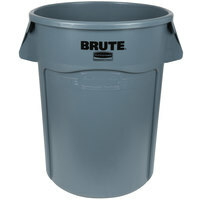 Meet The Brute, the number one industrial waste receptacle, only from Rubbermaid Commercial. This is the most durable workhorse in heavy duty containers. Engineered in all plastic with professional grade construction that won't rust, chip or peel. In fact, in drag tests with other containers, The Brute outlasted them all, going 20% further in distance than our closest competitor. Strong? Brute containers are built to last. They not only resist dents, with reinforced rims, they're virtually indestructible. They all have molded non-slip handles on the sides for easier lifting and emptying. Plus, you can also choose snap-on-lids for a secure, tight fit. No matter what the job, depend on the toughest guy in your crew. 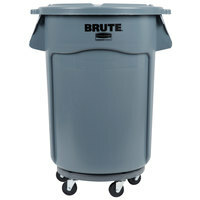 Brute heavy duty containers, only from Rubbermaid Commercial. Rubbermaid Commercial Products. You didn't think it was possible, but we've built a better Brute container. 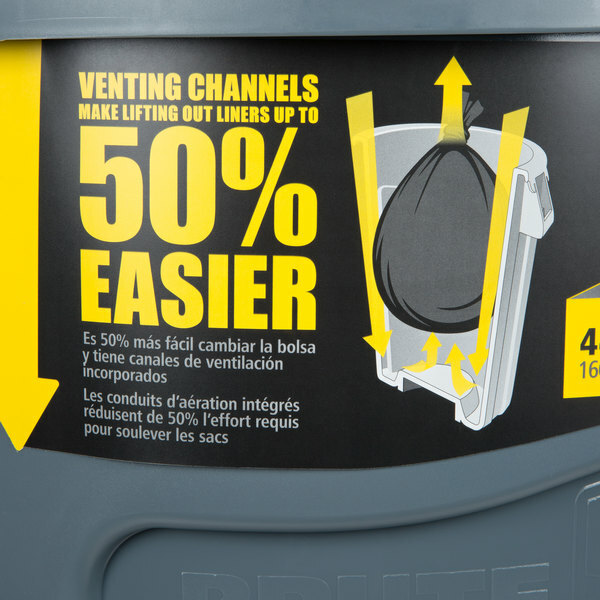 Others create a vacuum, but we have venting channels for increasing airflow, making it 50 percent easier to lift liners. The toughest just got more productive. 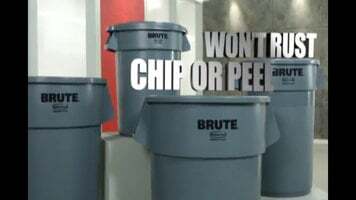 Learn more at rubbermaidcommercial.com. 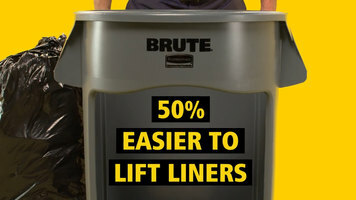 Rubbermaid's improved line of Brute trash containers feature venting channels that increase airflow, making it 50% easier to change trash liners than standard trash cans. They boast reinforced bases that are built to last and integrated rib structures that increase their strength while resisting breakage. The perfect trash can for our kitchen. Durable, easy to clean, and it generally withstands the usual restaurant kitchen abuse. Strongly recommend the dolly that is suggested to accompany it. This is the best in commercial trash can ! I have seen this very same product in many warehouses , gas stations , restaurants and malls ! I would buy this for my business ! These Trash Cans are the best. I have an easy time removing the bags, they have never gotten stuck no matter the weight. I suggest purchasing the flat locking lid with them. They have holes on the handles to bungie the top if necessary to keep out intruders! Like raccoons. I am Very happy with this product. It performs great and takes a beating as well. Fits our trash can dolly perfectly. Doesn't hold bad smells either: real easy to spray out to clean. It is exactly what I needed and fits the dolly great, best price you can find and super fast shipping had it in 3 days! These trash containers are well made and durable. We put them through quite a workout in our restaurant and use them everywhere. A good value. We bought these to use at our youth baseball fields. Around here, parks are carry-in, carry-out. But because we sell items at a concession stand we felt it was not fair to generate the waste and not give people a place to throw it away. We needed sturdy barrels that could withstand the elements and these are excellent! Bags are easy to find and the barrels are very tough.